Unidentified Aerial Phenomena - scientific research: A catalogue of UAP related "fragments" which have been analysed. Do we already know of any of these samples? The closest match I could find was the round disc like item in the image below. This is the complete collection of material sent to Art Bell in 1996. In a video clip on the TTSA website blog, the image I have labelled number 2 is shown on a screen behind TTSA members, at 1minute 3 seconds. The full screen view shows what appears to be a set of four unwrapped samples, rather than the samples themselves. Is the Tiffin, Ohio Ed's samples, from 2003. @Jay09784691 twitter 6 November 2018 suggests that this image shows a test tube containing an "implant." This also featured on a TTSA video clip at one point. Is one of the fragments which an anonymous individual sent to the late Art Bell in 1996, which was said to have come from Roswell. The closest match to this image is a fragment from 1972, another "Ed" from Ohio. Is the 1985 (some say 1987) Bob White fragment. 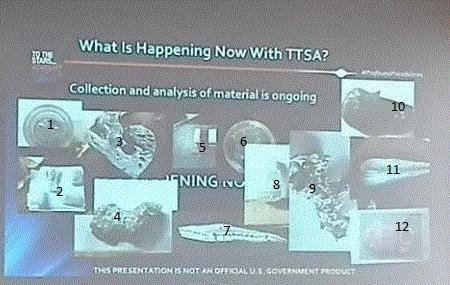 In trying to answer the question as to whether or not we had previously seen the fragments shown in the TTSA slide, I looked around for a list or catalogue of such material, said to have come from a UAP. Surprisingly, I couldn't find any such list or catalogue. So, I have compiled a catalogue of my own,which in version one runs to 34 events. I welcome corrections, additions etc.Please send these to keithbasterfield@yahoo.com.au I am currently preparing a PDF copy of the catalogue, and then will look to host it on someone's website. A PRELIMINARY CATALOGUE OF ALLEGED “FRAGMENTS” REPORTEDLY ASSOCIATED WITH SIGHTINGS OF UNIDENTIFIED AERIAL PHENOMENA WHERE ANALYSIS(ES) WERE CONDUCTED. Over the years, there have been a number of individuals who have come forward submitting “fragments” which they have alleged, are associated with sightings of Unidentified Aerial Phenomena (UAP.) In more recent times To The Stars Academy (TTSA) has initiated the A.D.A.M. project to collect and analyse such items. In attempting to follow and understand the discussions on various “fragments,” I have been hampered by a lack of a centralised list, or catalogue of such material. The purpose of this preliminary catalogue is to take a first pass at bringing together the diverse accounts of physical “fragments” which are scattered throughout the UAP literature. “fragments” found in crop circles; stains on clothing of abductees; soil samples; liquid samples or samples of vegetation; or pancakes. Instead, the catalogue focuses on samples of materials said to have been ejected by/dropped from UAP, or have been found after a UAP sighting. Location of the UAP sighting – Location. The date of the sighting – Date. The reported link between the object found and the UAP sighting – Link. A description of the item found – Specimen description. Details of any analysis (es) conducted – Analysis. Whether or not there are any images/photographs of the sample – Image. Reference(s) for the information above – Reference(s). 1. Location: Aurora, Texas, USA. 2. Date: 17 April 1897. 3. Link: A UAP is said to have sailed over the public square and collided with a windmill, exploding into pieces. A re-investigation was conducted in 1973, by Journalist W Case and McDonnell Douglas aircraft company personnel. Fragments found by Case et al. By: McDonnell Douglas aircraft company personnel. Conclusion: 83% aluminium; 16% Ca; zinc with possible traces of manganese and copper. Could have originated with post 1908 common aluminium alloys. Holliday, J E. McDonnell, report on the Aurora case. Unpublished. 13 August 1973. On site investigators were Ronald, A and Gurney, N J (12 May 1973.) Cited in Vallee, J F. “Physical analyses in ten cases of Unexplained Aerial Objects with material samples.” Journal of Scientific Explanation, Volume 12, number 3, pp359-375. 1. Location: Ubatuba, near Sao Paulo, Brazil. 2. Date: 1933 or 1934. 3. Link: Story emerged in 1957. Witnesses reported seeing a disc which exploded, showering bright, metallic fragments. A few fragments were recovered. Conclusion: Major component – highly pure magnesium. c. By French laboratories including Prof Lorin, Oray University. Conclusions for b and c: Magnesium and magnesium oxide with very small amounts of aluminium, calcium and iron. The above information is from Vallee, J F. “Physical analyses in ten cases of Unexplained Aerial Objects with material samples.” Journal of Scientific Explanation, Volume 12, number 3, pp359-375. The following information is from Clark, J. “The UFO Encyclopaedia” Volume 2. Apogee Books. Detroit. pp 353. · Surface of all samples covered with scattered areas of white material. Via Fontes. As set out in Physical evidence” APROB March 1960, 1, 3. By: Mineral Production laboratory. Chemist Luisa Maria A Barbosa. Methods: Chemical, spectrographic and x-ray tests. · Chemist Elson Teixeira – second spectrographic analysis. b. Brazilian army did tests. c. Laboratory of crystallography did additional x-ray diffraction tests. One sample density 1.8666; whereas pure magnesium is 1.741.
d. The testing procedure destroyed one of the three samples. Analysis 3: As reported in the APRO Bulletin, Jul/Aug 1970 pp 1, 5. By: APRO via Walter Walker Metallurgical Engineer, University of Arizona. Methods: Microstructural studies; x-ray diffraction analysis; microstructural studies; dislocation etch-pit studies. Analysis 4: 1968. As described in Craig, R. 1995. “UFOs: An insider’s view of the official quest for evidence.” University of North Texas. Denton, Texas. By: Roy Craig, physical chemist with Condon Committee. Got piece from APRO. Tested at National Office Laboratory, Alcohol and Tobacco Tax Division. Other tests at Dow Chemical’s Metallurgical Laboratory came to the same conclusion. 6. Images: In Craig 1995. 1. “APRO metal extra-terrestrial?” NICAP Special Bulletin, May 1960:3. 2. “APRO’s new finding on Ubatuba magnesium.” APROB Jul/Aug 1970: 1, 5. 3. Craig, R. 1995. “UFOs: An insider’s view of the official quest for evidence.” University of North Texas. Denton, Texas. p 136 and chapter 8. 4. “Physical evidence” APROB March 1960, 1, 3. 5. Vallee, J F. “Physical analyses in ten cases of Unexplained Aerial Objects with material samples.” Journal of Scientific Explanation, Volume 12, number 3, pp359-375. 1. Location: San Antonio, New Mexico, USA. 2. Date: 16 August 1945. 3. Link: Jose Padilla (aged 9) and Remigo Baca (7) found a gouge in the earth and a circular object at the end of it. They picked up an artifact. Was in Remigo’s possession for a long time, then Padilla’s for one year (in a house in San Antonio.) Two samples given to Frontier Analysis Ltd. By MUFON, in October 2015.
a. A piece of thin, shiny material, which could unfold itself when folded. Sample not available. b. Two pieces of metal from the inside wall of the crashed object. By: Frontier Analysis Ltd. 2015. Methods: Microscopic examination; infrared analysis; Inductively Coupled Plasma (ICP)/Mass spectrometer (MS); isotopic ratio analysis. · They compare with cast aluminium in the 3XXX X series – these alloys have wide use in engine crank cases; gas and oil tanks etc. · Isotopic ratios for nickel, copper and zinc compare to terrestrial values. Technical service response number UT090. Frontier Analysis Ltd. P A Budinger, dated 31 October 2015. 3. Link: Science journalist Andrew Von Retyi was told that NASA was in possession of physical evidence. By: (1974). ‘Dr Cris.’ Polish biophysicist and engineer at NASA contractor. Good, T. 2007 “Need to know.” Pegasus Books. NY. P61. 1. Location: Roswell, New Mexico, USA. 3. Link: On 24 March 1996 sample taken to the International UFO Museum and Research Centre. Source reported to be from a GI at the Roswell crash. · Raised lines on it. By: New Mexico Institute of Mining and Technology, Socorro, New Mexico. Chris McKee. · McKee pointed out that the sample had not been cleaned prior to testing so elements could be from soil. A Utah based artist Randy Fullbright claimed that the fragment was a piece of jewellery scrap from his studio. Miller Johnson of the RUFOMARC compared samples from the studio with the fragment and concluded Fullbright was correct. 7. Reference: Baker, A. 1997. “UFO Sightings.” TV Books. New York. Pp73-75. 1. Location: Between San Mateo Mountains and Sierra Blanca, West of Roswell, New Mexico, USA. 3. Link: In April 1996, Art Bell and Linda Moulton Howe, received a series of five typed letters from an anonymous source, plus two shipments of metal pieces through the post, reportedly about a crash at Roswell. The letters were postmarked South Carolina. The source stated that the account came from his grandfather’s diary; and the pieces from a box belonging to his grandfather. a. From the second letter – several pieces square cut. Grey metal. b. From the third letter – six pieces of metal different from the first batch. Said to have come from the external outside of the crashed disc. Layered metal. (A) a. several pieces square cut. Grey metal. Methods: scanning electron microscope. Energy dispersive spectroscopy. Conclusions: shiny side contained greater than 95% magnesium; 2-3% zinc, layers – Mg and small Zn separated by thin layers of high bismuth content. Thin, wavy layers of bismuth 1-4 microns think; the Mg/Zn layer was 100-200 microns thick. 26+ alternating layers. (B) By: Eric Hauri PhD, Ion microprobe technician, Carnegie Institution of Washington, DC. 20 July 1996. · 11% more Mg26 in the sample but not outside terrestrial range. (C) Sample of the bismuth-magnesium-zinc material. By: Hal Puthoff, EarthTech International on 7 January 1999. Methods: Not stated in reference. Conclusions: Linda Moulton Howe posed a series of questions to Puthoff. Howe states that a couple of months later the sample was returned but no definitive answers to her specific questions were given. (D) By: Hal Puthoff, EarthTech International in 2012. Conclusions: No interesting/anomalous outcomes in tests involving fields. Bi channels of the size seen in the sample layered between Mg layers of the size seen in the sample closely match a waveguide structure that permits sub-wavelength THz (terahertz) signals to propagate freely. 3. Link: On 4 July 1997 at Roswell, New Mexico, Dr Russell VernonClark announced test results, on a sample given to Dr. Roger Leir in August 1995, by an individual who stated they were pieces of a disc from the 1947 Roswell crash. Methods: Inductively coupled plasma/mass spectrometry; secondary ion mass spectroscopy. Nickel isotopes – Ni60 26.1%; Ni61 1.13%; natural abundance on Earth. Ratio is about 23:1. In the sample the ratio is 5:1. Zinc isotopes – Zn64 48.6%; Zn66 27.9% natural abundance on Earth. Ratio is 7:4. In the sample ratio is 4:9. Silver isotopes – Silver107 and Silver109. Ration on Earth is 1:1. In the sample 1:2. Germanium isotopes – Germanium72 isotope – 94% of in sample. Natural terrestrial is only 27%. Composition of material is greater than 99% silicon. 1. The testing was arranged by television producer Christopher Wyatt. States that Vernonclark was employed as an Environmental Health and Safety specialist in the chemistry department UCSD, with a PhD in chemistry gained in 1993. His Cv is said to show publication of eight scientific papers since 1993. He states that there was a second independent set of tests undertaken by an unnamed organisation which showed roughly the same unusual isotopic ratios. 1. Maury island, Washington State, USA. 2. Date: 21 June 1947. 3. Link: Witness reported six large flat doughnut shaped objects. One descended, there was a dull explosion heard and sheets of light, thin material came from the object. At the same time witnesses were showered with hot, dark fragments. b. Ray Palmer and Kenneth Arnold published an analysis – Calcium, iron, zinc and titanium. Also aluminium, manganese, copper, magnesium and silicon, nickel, lead, strontium and chromium. Traces of silver, tin and cadmium were reported. Vallee, J F. “Physical analyses in ten cases of Unexplained Aerial Objects with material samples.” Journal of Scientific Explanation, Volume 12, number 3, pp359-375. 3. Link: Chuck Wade visited the site and found the fragment. Submitted 2014 to Paul Garver, ASD Mufon NM. Garver sent it to MUFON HQ then to Frontier Analysis Ltd., who received it on 27 March 2014. Methods: ICP-MS and ICP-AES elemental analysis; infrared analysis; microscopic analysis. Isotopic analysis on nickel, copper and gallium consistent with terrestrial values. 1. MUFON CMS case file is 52614. 2. Technical service response number UT086. Frontier Analysis Ltd. P A Budinger. Dated 22 August 2014. 3. Link: Chuck Wade visited the site and located a number of metal fragments and one sample of plastic-like material. Sample received by Frontier Analysis Ltd. 6 June 2005 via Brian Boldman. Eleven pieces in all. Six were pliable foil-like metal; one was semi-pliable foil-like metal; one not pliable metal; one semi-pliable foil-like metal’ one plastic-like material; and one not pliable foil-like metal. Methods: Infrared analysis. Geiger counter. Technical service response number UT049. Frontier Analysis Ltd. P A Budinger dated 17 May 2006. 1. Location: 100 feet South-east of main Roswell 1947 “crash debris field”, New Mexico, USA. 3. Link: Frank Kimbler visited the site and located a fragment in 2014. Sample received by Frontier Analysis Ltd. on 23 May 2014. Methods: Microscopic examination; infrared spectroscopy. · Composed of an epoxy resin ester based on bisphenol-A with quartz filler. It has red paint on it. · Elemental analysis results typical of elements in dirt/soil. Technical service response number UT084. Frontier Analysis Ltd. P A Budinger dated 7 July 2014. 1. Location: Abbiate Guazzone, Italy. 2. Date: 24 April 1950. 3. Link: Bruno Focchim reported seeing a UAP and entities. Next day he found a few pieces of metal at the site. Three pieces of shiny metal. Good, T. 1999. “Alien Base.” Harper Perenial. NY. Citing “Examination of some metallic fragments attributed to a flying saucer.” Report no ISML N530954/4157. Instituo Sperimentale dei Metalli Leggeri, Novara, 30 September 1953. 1. Location: Washington, DC, USA. 3. Link: Journalist Frank Edwards, reported an object fell to the ground when a Navy pilot chased a flying disc. Object was recovered an hour later. Edwards, F. 1966. “Flying Saucers Serious Business.” New York. Bantam. Cited in Vallee, J F. “Physical analyses in ten cases of unidentified aerial objects with material samples.” Journal of Scientific Exploration, Volume 12, number 3, pp357-375. 3. Link: CIA had custody of a strange piece of metal which fell from the sky during the 1952 UFO flap. · Smooth on one side, bubbly on the other. Vallee, J. 2017. “Forbidden Science – Volume three.” Anomalist Books, San Antonio, Texas. p432, citing interview between Vallee and Arthur Lundahl. 2. Date: 14 (13th?) December 1954. 3. Link: Journalist Frank Edwards – numerous witnesses saw three discs. One wobbled and descended. Emitted thin stream of silvery liquid. 4. Sample description: None given. By: Dr Risvaldo Maffei - Unnamed Brazilian laboratory. Conclusions: Tin was the main component. 10% of material composed of other substances. The above information from Vallee, J F. “Physical analyses in ten cases of unidentified aerial objects with material samples.” Journal of Scientific Exploration, Volume 12, number 3, pp357-375. The information below from Maney, C A. “The Campinas sighting.” FSR Volume 8, number 3 pp 3-6. (May/Jun 1962.) Cites date as 13 December 1954. 3. Link: A woman saw three objects in the sky. One object, round-shaped, dull-grey in colour, like two plates inverted and stuck together. A liquid dropped from it. She went to spot and found a brilliant stain 10cm in diameter on concrete. Her friend Prof. Benedito G Nascimento collected the sample and took it to a chemist. a. By: Young Laboratories – Chief chemist Dr Visvaldo Maffei. · Weight was 1.30 grams. b. By: Brazilian Air Force. 2. Vallee, J F. “Physical analyses in ten cases of unidentified aerial objects with material samples.” Journal of Scientific Exploration, Volume 12, number 3, pp357-375. 1. Location: Vaddo Island, 90 kms NNW of Stockholm, Sweden. 2. Date: 17 November 1956. 3. Link: Stig Ekberg and Harry Sjoberg sighted an 8m by 3m flattened sphere which approached to within 100m of them and 1m off ground. They found a shiny rock at the landing site. By: SAAB airline manufacturing company. Mr Sven Schalh. Also laboratories in Sweden, Denmark and Germany. Conclusions: Composed of tungsten carbide and cobalt consistent with manufactured products. Von Luidwiger, I. “Investigating Mysteries.” Unpublished book manuscript. Personal communication, courtesy of NIDS. Cited in Vallee, J F. “Physical analyses in ten cases of unidentified aerial objects with material samples.” Journal of Scientific Exploration, Volume 12, number 3, pp357-375. 1. Location: Maumee, Ohio, USA. 2. Date: 13 July 1967. 1. APROB Jul/Aug 1967, pp1, 3. 1. Location: Kiana, Alaska, USA. 3. Link: An Eskimo is reported to have found two pieces of material on a river bank following an aerial phenomenon. Professor Peter Sturrock acquired one piece. · Looks as if poured from a source close to the ground. Vallee, J F. “Physical analyses in ten cases of unidentified aerial objects with material samples.” Journal of Scientific Exploration, Volume 12, number 3, pp357-375. Citing personal communication to the author. Quoted with permission. 1. Location: Barborton, Ohio, USA. 3. Link: Edward Lunguy saw a hovering orange ball of light in the sky. Stationary at first, it moved north-east then all of a sudden blew up silently. Three weeks later while mowing his mother’s lawn he found an object. Two years later his wife suggested it be tested. · 13 x 9 x 4 inches in size. (A) By: Robert Oldrieve (worked at NASA) – September 1974. · Melted at very high temperatures. (B) By: David Burns – August 1974, Assistant professor of Geology, Kent State University. 1. ERA, Bradford, Pennsylvania, 25 December 1978. 2. Schwarthberg, R. “The day black glass fell from the sky.” “Beyond Reality” Magazine, December 1979. pp34-35 & 58. 2. Date: 1975 or 1976. 3. Link: Two students heard a metallic sound overhead. Twelve foot disc in air. Four other objects appeared. Spouts of liquid from original disc. Objects left. After letting material cool for 10 minutes witnesses recovered two metal chunks. · One side showed evidence of violent bubbling. Other side was flat. (A) By: Mechanical engineering petroleum company, Central America. Conclusions: Aluminum alloy with magnesium and tin. Non-magnetic. Contained traces of unidentified material. Easy to cut – presented very fine granulation. (B) By: Valle, J and Puthoff, H.
Conclusions: 93.7% aluminium; 4.8% phosphorous; 0.9% iron; with traces of sulphur and an unexplained oxy-carbide layer. No fluoride and no water contrary to most aluminium samples. Also used scanning ion mass spectroscopy (SIMS). Found surface layer of carbon, oxygen and nitrogen, beyond this aluminium and magnesium with potassium, sulphur, sodium and silicon. Trace amounts of phosphorous and iron. Vallee, J F. “Physical analyses in ten cases of unidentified aerial objects with material samples.” Journal of Scientific Exploration, Volume 12, number 3, pp357-375. 1. Location: Council Bluffs, Iowa, USA. 2. Date: 17 December 1977. 3. Link: Two residents reported seeing an object which crashed to the ground in the vicinity of a park. A bright flash was seen plus flames 7-10 feet high. Witnesses then found a large area covered with a mass of molten metal that glowed re/orange. Police and firefighters arrived within minutes. Two independent witnesses saw hovering red light. 4. Sample description: originally molten mass running over ground in a 6 feet x 4 feet area. Secondary patch was 2 feet by 4 feet. By: Iowa State University and Griffin Pipes Product Company. Methods: X ray fluorescence; electron beam microprobe; emission microscopy techniques. “The material is chiefly iron with very small amounts (less than 1%) of alloying materials such as nickel and chromium. The slag is a foam material containing metallic iron and aluminium with smaller amounts of magnesium, silicon and titanium.” The white ash was found to be calcium with some magnesium. Vallee in 1997 stated “Origin remains unknown.” Not a meteorite. No local firms in operation which could have produced it. Not a hoax. Not a piece of equipment from an aircraft. 1. Location: Jopala, near Puebla, Mexico. 3. Link: Vallee was in Mexico in November 1978 and local authorities told him of a fall and recovery of a metallic residue following the observation of an unknown aerial phenomena in the mountains near Puebla. 4. Sample description: Metallic residue. Has the date of the “crash” as 29 July 1977. 1. Location: Rendlesham Forest, England. 3. Link: No knowledge of this particular sample or how collected. Sent by Bennie Foggin. 4. Sample description: Collection of relatively fine shavings on the order of 1mm. Methods: scanning electron microscope; energy dispersive spectroscopy. 3. Link: Material given to Ronnie Dugdale. Now held by John Hanson. Sample said to have been sent to USA for analysis. 1. Location: Colorado/Nevada border, USA. 3. Link: Bob White and friend were driving to Las Vegas. Large bright UAP seen. Flew into sky joined larger UAP. Glowing rang ember fell to the ground. Went to that place found a tear drop shaped metal, very hot at first. · Weighed less than 2 pounds. (A) By: New Mexico Institute of Mining and Technology. 1996. For NIDS. Methods: x-ray fluorescence; electron microscope. · X-ray – 85%Al by weight; 9% Silicon; 2% Iron; 0.9%Ca; 0.7%Cl; 0.6%Na. · There were no anomalies in the results. (B) By: Dr Robert Gibbons – 2003 – former NASA scientist. Conclusions: Isotopic ratios – May 1999 – La Jolla, California showed ratio of isotopes of strontium was 0.712. Technical service response number UT009. Frontier Analysis Ltd. P A Budinger, dated 25 September 2000. 3. Link: Bennie Foggin heard a noise like “metal grinding on metal.” Couldn’t see anything. Looked again and then saw a very square looking, silent UAP in the sky. 300ft long with a 100ft wing. Travelled west to east. As he watched it he heard something hit the ground near him. He had a look around the area and found a specimen – off the road in moist, dirt area. The sample was misplaced till around 2006. Conclusions: 89.1% aluminium; 9.9% silicon; 0.8% iron; 0.2% Mg.
(B) By: US Diagnostics – June 2007. Conclusions: Primarily homogenous internal structure with some small (less than 1mm) spots or specks likely to be bubbles. · Not exotic or unearthly. (D) By: Frontier Analysis Ltd.
Methods: Infrared spectroscopy; energy dispersive x-ray spectroscopy; Geiger counter. · Could have resulted from a broken weld. 1. Technical service response number UT050. Frontier Analysis Ltd. P A Budinger dated 14 April 2007. 3. Link: NIDS investigation. Ejected material. 4. Sample description: No sample available. Al; with Si; C; Mg and Ca. 1. Location: Needles, California, USA. 3. Link: Emmett Hayes, UFO researcher and podcaster used a metal detector to find samples. · Appeared aluminium in nature. George Knapp reported that he had interviewed witnesses who told him that an object seemed to come down from the sky and “crash,” and that within 20 minutes five helicopters turned up and a Skycrane took an object away. provides further reports from Knapp. Possibility of a UAV. 1. Location: Newtown, Pennsylvania, USA. 2. Date: 21 January 2014. 3. Link: MUFON case number 55131. A witness reported a “vortex in the sky” from which shiny, particles fell onto the ground. Submitted by Donna Luther MUFON SSD/FI Pennsylvania. Methods: Infrared analysis; microscopic analysis. Technical service response number UT083. Frontier Analysis Ltd. P A Budinger dated 10 June 2014. 1. Location: Claymont, Delaware, USA. 2. Date: 29 June 2014. 3. Link: MUFON case 57833. Multiple orange-red UAP up to 24 in number. Silent and floated irregularly. Moved of silently. One object dropped something that “burnt wildly down to the ground.” Residual fragment found. Submitted by Dave Segal, MUFON FI-PA and DE. Received by frontier Analysis ltd on 21 July 2014. Methods: Infrared spectroscopy; microscopic examination. · Fragment has the appearance of insulation. However, presence of palmitic acid is unusual. Technical service response number UT087. Frontier Analysis Ltd. P A Budinger dated 26 September 2014. 1. Location: Not given. Named as Sierra” case. 2. Date: Withheld by Vallee. 3. Link: Not given by Vallee. 4. Sample description: Two samples. 99.38% titanium by weight. Al 4020ppm; Sc 755 ppm; Fe 561ppm; Mg 321ppm; V 202ppm; Cr 197 ppm; Mn 131 ppm; Ni 137 ppm; Ca 73ppm; K 16 ppm. Ti46 – Standard is 8.25% sample is 8.7 and 7.66. Ti47 – Standard is 7.44 sample is 5.33 and 3.83. Ti49 – Standard is 5.41 sample is 5.76 and 5.26. Iron 98.35% by weight; Mn 8543 ppm; Cr 3500 ppm; Cu 2032 ppm; NI 613 ppm; Sc 592 ppm; Co 94 ppm; Zn 76 ppm; Al 63 ppm; Ca 10 ppm; V 7 ppm. Isotopes yet to be done. The following case is frequented cited in the UFO literature as a fragment. However, there was no visual UAP sighting associated with the case. 1. Location: Tiffin, Ohio, USA. 3. Link” No UAP. “Ed” found a piece of metal in his side yard when raking up leaves. Apparently been there since winter. Scanning electron microscope. EDS. Geiger counter. (B) By: Dr Ayengar via frontier Analysis Ltd.
(C) By: Olson, Martins, Topolski – 19 July 2015. From Bennie Foggin labelled “Ohio Ed’s metal sample.” Sample was less than one cubic centimetre. · Ag and Mg appear artificially added – whereas Si and Fe content likely impurities. Update as at 28 November 2018. Following the welcome imput from a number of researchers, I am in the process of preparing version 2.2 of the catalogue.